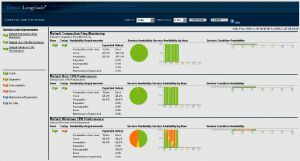 NEWTON, MA -- (MARKET WIRE) -- November 8, 2005 -- Heroix (http://www.heroix.com), a leading provider of application performance management software, today announced a major upgrade to its Longitude software for system and application performance monitoring and reporting. By providing comprehensive platform and application monitoring using an agentless architecture, Longitude improves performance while saving money and reducing the time burden on IT staff. Central to Longitude V2 is the ability to define and monitor Service Level Agreements based on established system and application performance metrics. A real time SLA dashboard provides an up to the minute, graphical view of service level performance, as well as historical reporting and drill-down capabilities to investigate shortfalls in service compliance. Longitude includes out of the box SLA definitions for common performance issues such as CPU usage and server reachability. Additional service conditions can be defined individually or can combine a variety of performance metrics to more closely emulate business service conditions. Longitude V2 also features user-definable transaction monitoring. Users can measure and report on HTTP URL availability, response time and content (e.g., is an e-commerce site available, is it responsive to requests, and is it delivering the expected content), SQL query status and response time, DNS name resolution, service and process existence, ping, and other common transactions. "Longitude provides a more realistic picture of Service Level Agreement performance by taking into account the fact that meeting an SLA normally depends on multiple factors," said Howard Reisman, Heroix Founder and CEO. "For example, suppose five different monitored servers are running a Web application. If one server goes down; that might still be 'acceptable' for the particular service level. The condition might fall to 'degraded' if two servers go down, and so on. Instead of looking at the components individually, Longitude understands that the overall business service level is the primary concern." Also new to V2 are added database and infrastructure monitoring capabilities including support for MySQL, Active Directory, and DHCP. A new trend monitoring feature keeps tabs on long term utilization trends and alerts IT departments if CPU, memory, or disk usage near saturation sooner than expected. Heroix offers a 14-day free trial of Longitude (http://www.heroix.com/v2pr.asp). First launched in May (http://heroix.com/news/news_press148.htm), Longitude is agentless system and application monitoring software that enables IT organizations to improve performance without requiring software to be installed on each server. Pre-packaged monitoring solutions are provided for Microsoft Windows®, RED HAT® Linux, SuSE® Linux, Sun Solaris™, Hewlett-Packard HP-UX®, IBM AIX®, Microsoft IIS, Apache™ Web Server, Microsoft SQL Server, Oracle®, MySQL, Microsoft Exchange Server 2000/2003, IBM WebSphere®, BEA WebLogic®, JBoss®, Active Directory, and DHCP. Available immediately, Heroix Longitude pricing starts at $299 per monitored system. Support services and subscription pricing are also available. Heroix delivers award-winning software products that help organizations optimize the availability and performance of applications, databases, systems, and IT infrastructure running across multiple platforms. Today, with a presence in over 40 countries, Heroix has delivered performance management solutions to over 1,000 organizations worldwide, including Horizon Lines, Kaiser Permanente, Honeywell, Tembec, Motorola, Inc., and Boston Sand & Gravel Company.